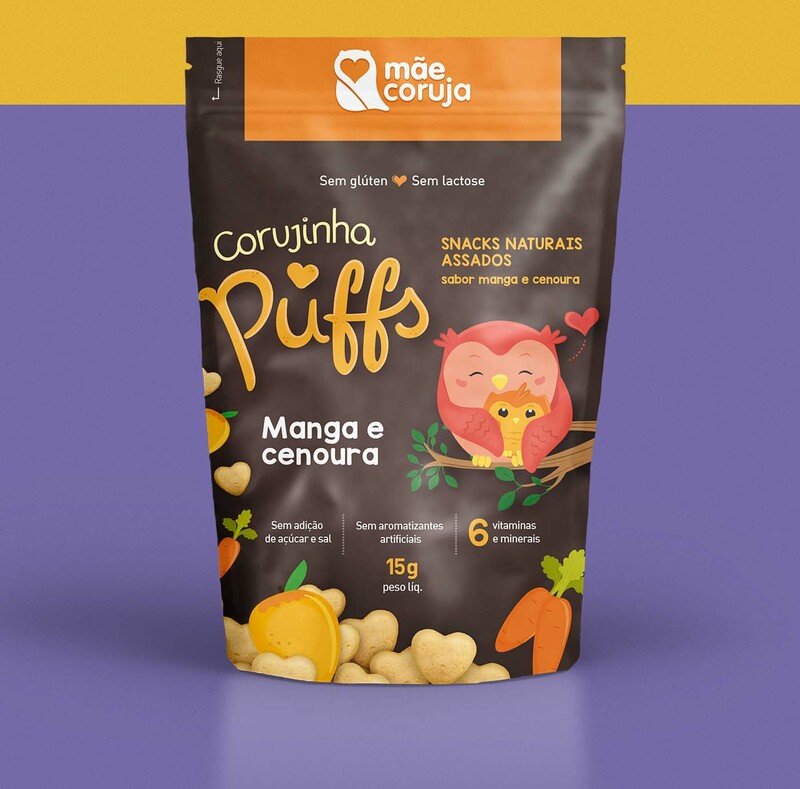 Corujinhas Puffs snacks line is aimed at young children. Natural flavours of fruits and vegetables are healthier and contribute to food education. The snacks for kids are made without artificial colorings, flavourings and preservatives. No salt or sugar are added as well. The packaging design for snacks for this young consumers considered important values we wanted to transmit: protection, safety, modernity and affection. As a result, mothers receive the message in a clear way through the whole set of products, package design and display layouts on points of sale. To win the little consumers over cute shapes for the snacks were created and a beautiful illustration of a mother owl, the character of the brand. As small children eat smaller quantities we opted for using a stand-up pouch for the snacks. Stand-up pouches can be produced in lower runs compared to conventional flexible packages. There is no need of an automated flow-pack equipment. It is possible to manually pack small quantities, ideal for a single serving. The packages also have a zip-top, in order to facilitate opening and closing. On points of sale, stand-up pouches are perfect for visibility on shelves. Information on front and back were carefully projected to transmit all the characteristics of the snacks.